As seen in "MythBusters: Viewer Special I." Explanation: Probably since there's been school recess, children have been warning allergy-prone classmates their eyeballs would pop out if they sneezed. But can a forceful "achoo" really put your eye out? The MythBusters put this eye-popping rumor to the test by forcing a few sneezes. Let's start with Anatomy 101: Your eyes are actually quite secure, and your eye sockets aren't connected to your nose at all. So, although a sneeze can erupt from your nose at an explosive 200 miles per hour, it can't transfer this pressure into your eye sockets to dethrone your eyeballs. Plus, there's no muscle directly behind the eye to violently contract and push the orbs outward. Eyelids aren't big on muscle power, so even if they were tasked with keeping eyeballs in place, they'd fail. So why do eyelids snap shut when a sneeze comes on, as if they're guarding the gate? Quite simply, it's a reflex. The nose and eyes are linked by cranial nerves, so the stimulation from the sneeze travels up one nerve to the brain, then down another nerve to the eyelids, triggering a blink for most people. 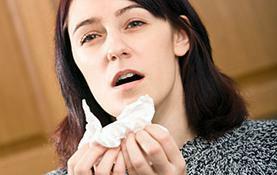 However, it's possible for some people to sneeze with their eyes open — without fear of peeper loss. Now that your eyes are open, too, you can see right through this myth.